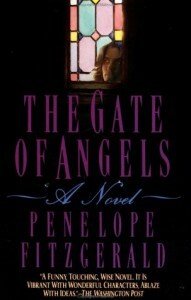 The Gate of Angels, Penelope Fitzgerald, Carrol & Graf, 1993 (c1990), ISBN 9780881849608, 352pp. I can’t remember where I first heard of Fitzgerald, although I suspect it was from one of the well-read subscribers to Rondua, the Jonathan Carroll mailing list. She is not a magic realist or fantasy author (as far as I can tell from reviews of her work and the present volume), although the book in question could be considered a ghost story it one wanted to interpret it that way. Of the authors of my acquaintance, she most resembles Robertson Davies in style and form. I don’t think that I am creating a relationship based on subject material, although I must admit that Davies also wrote a couple of novels of love and the university, as well as a collection of ghost stories. The year is 1912. Fred Fairly is a Young Fellow at Cambridge’s St. Angelicus College, which has fairly strict ideas on the proper conduct of its members, including a requirement of non-marriage. While biking, Fairly collides with an unlit cart and is injured. Upon regaining consciousness, he finds himself in a bed with a fellow victim, who, by circumstance and a gold ring on her fourth finger, is mistaken as his wife. Fred finds the prospect not displeasing. In other hands–say P. G. Wodehouse or Thorne Smith–such a plot would be filled with spirited high jinx, including mistaken identities and timing difficulties. Fitzgerald’s humor is not of that sort. Like Davies, it derives less from exaggeration and more from verisimilitude. This is not to say that there are not amusing passages. I especially enjoyed Fred’s family: his suffragette mother and two younger sisters and his put-upon father, the Rector. This is Fitzgerald’s eighth novel, and her ability in story and sentence construction is masterful. Although I found this book to be a little dry for my particular taste, I expect I will try a different vintage of hers at some later date.